If you are having a big event, party or having a promotion then you will need to order lots of printed balloons. We can print these balloons for you, so check out some of our other pages for more information. What do you do if you only need one, or maybe a few personalised balloons? That’s no problem, we can supply individually personalised balloons, we have a few options for you. 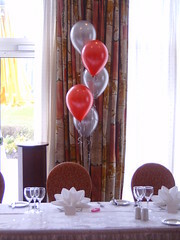 The first option is the Deco-Bubble or Bubble balloon, these are really popular at the moment. Bubble balloons are made from a stretchy plastic and are filled with helium gas. They can have several designs for the ‘accent’ balloons that come with them, two popular options are to have little latex balloons inside or one large latex balloon. Deco-Bubbles are personalised with a self-adhesive vinyl, this vinyl will be cut out to your requirements on a vinyl cutting machine, the excess vinyl will be ‘picked’ away and the remaining vinyl design will be applied to your balloon. Normally the same design will be applied to both sides of the balloon, but they can have different designs on each side if required. Bubble balloons are filled with helium gas to allow them to float, but due to the material they are made of and the way they need to be tied they are not really suitable for refilling. Bubble balloons will normally float for at least a few weeks and it is not unusual for them to float for a month or two. The second option is to personalise a foil balloon. The foil balloons normally come in two different sizes 18″/20″ and 36″, this refers to the diameter of the balloon before they are inflated. The foil balloons that we can personalise are available in three shapes Hearts, Rounds, and Stars. As with the bubble balloons they are personalised with vinyl cut to shape in a vinyl cutter. Foil balloons are made from a ‘foil’ type material made out of a metallic plastic material, often called mylar. They are filled with helium gas to allow them to float, the gas is inserted via a self sealing valve which will allow the balloon to be refilled if required. Foil balloons will start to look a little deflated after a few day and will float for about a week or so. The third option we have is picture foils. We can supply balloons which have been printed with a full-colour image. The image can be a photograph, text, graphics or a mix of them all. In the past, we have had to order these from our wholesaler, which increased the price and the lead time, but we will soon be able to print these balloons in house. These balloons are similar to the normal 18″ round foils, just a bit bigger. They have a base colour of white, but the image is any colour you want. When inflated with helium gas all of our Deco-Bubble and foil balloons will be supplied with an attached weight of some sort. This helps to prevent the accidental release of the balloon into the environment, this is important as these balloons are not bio-degradable. You can check out our Environmental Policy here. What Type Of Balloons Do You Print Onto?